You can order a separate care kit for wax oiled floors containing repair wax oil matching the color of your floor, clear surface wax oil, WischFix detergent recommended for wax oiled floors and a handy spray bottle of conditioning and cleaning wax. 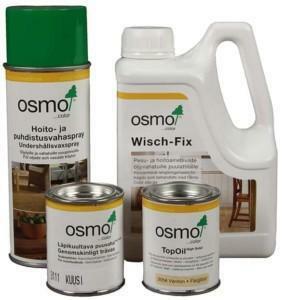 You can find ready colors to match most of our products in Osmo Color basic color map at the retailers. Through your retailer you can order a conditioner oil with special Timberwise colors to be included in your Timberwise care kit. All common conditioner and care products intended for lacquered floors can be used for our lacquered floors. When you use care products made for wax oiled floors, your floors will remain beautiful year after year. For further instructions on care and repair of Timberwise products, please read here.